Eighty-nine readers love this post. DrinkWire is Liquor.com’s showcase for the best articles, recipes and reviews from the web’s top writers and bloggers. 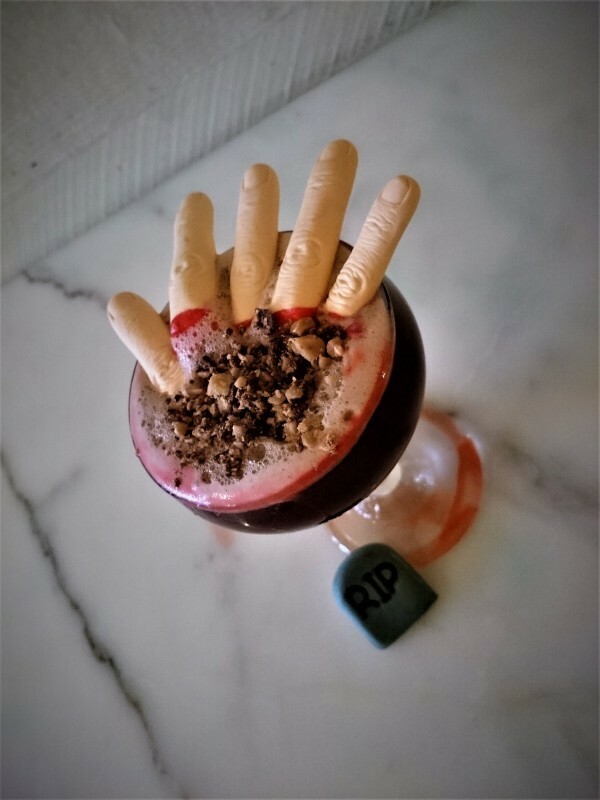 In this post, Paula Lukes offers a spooky cocktail. Halloween is one of my favorite holidays. For some it’s the memories of trick or treating and candy and the wonderful fall weather and colors. For me one of the things I personally look forward to during the month of October is all the great horror movies on TV! So many classics! I grew up watching Creature Feature and Chiller Theatre. One of my favorite horror movies of all time is The Stephen King movie Carrie. I love movies that are about the supernatural. Carrie White is a poor misguided girl with telekinetic powers who gets revenge on the people that wronged her. I always thought how cool it would be to be able to move things with my mind. Oh, come on don’t tell me you never thought about it! I tried to do it so many times. Did I succeed? Maybe! Carrie has one of the best endings of any horror movie. Her hand coming up from the grave still makes me jump every time! So when I was asked to create a spooky cocktail I thought how cool it would be to recreate that image or close to it! Besides the visual effects I wanted the cocktail to represent the character of Carrie. She was actually very sweet but when she got mad… Well we all know what happens! I chose Marie Brizard Chocolat Royal liqueur as the base spirit. You have to have chocolate for Halloween! It also has hints of vanilla and is velvety smooth. I added some Disaronno Amaretto because chocolate and almond go great together. Also Carrie did go just a bit nuts! To add some heat to my cocktail (there was quite a bit of fire in the movie!} I use Ancho Reyes Verde .It’s made with early harvested green chile and adds the fire that I wanted yet it’s very balanced. I add the ingredients to two egg whites that I dry shook to have a base to hold up Carrie’s fingers coming out from the grave and give it some nice froth. The fingers are Wilton icing decorations that I bought at Michael’s. No one was harmed in the making of this cocktail! I then sprayed the glass with Wilton’s red edible color mist to represent all the blood in the movie and topped it with Heath Bar Toffee Bit to resemble dirt. It also happens to be one of my favorite candies .I then added a little edible tombstone for effect. So for all of us that love a good scare and to celebrate one of my favorite times of year, have a Carrie White Cocktail! Beware of things that go bump in the night! Cheers and Happy Halloween! Boo! Dry shake egg whites. Set aside. Combine liqueurs in a separate shaker, add ice and hard shake. Add egg whites to the liqueurs and hard shake again. Pour ingredients into a coupe. Delicately place the icing fingers on top and lightly spray the coupe with the red color mist. Top with toffee bits and place the tombstone at the base of the glass. Cocktails for your spooky celebrations!